Last summer we released a feature to help you handle conflicts on Planning Center Resources. 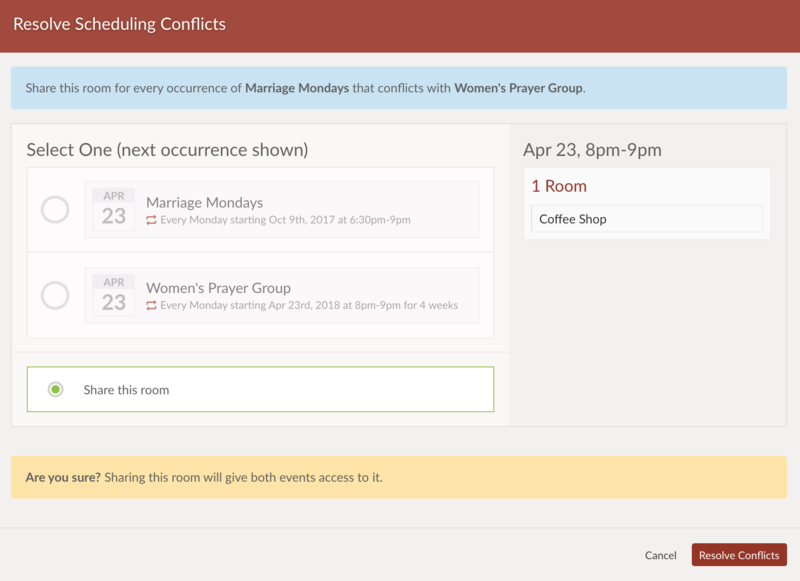 A Conflict Resolver allows you to choose one event over the other when they request the same room or resource. But what if a church’s cafe is big enough to handle two Bible studies at the same time? What if a women’s lunch and a youth worship night both want to use the gym and sound board on the same day, but the times overlap only for one hour during teardown and setup? In these circumstances, you don’t want to choose one event over the other, nor do you want to go through the hassle of asking the event coordinators to change the time of the events. The solution? A third option to allow the events to Share this room or share this resource. Once the conflict is resolved, a blue banner will appear across the top of the event pages sharing the room or resource. To learn the details of the event they are sharing with, they can click the tell me more button on the right hand side of the banner. As always, please let us know what you think! We hope this option is a helpful addition to your conflict-resolving tool belt! Take care, be fair, don’t lose your hair, and feel free to share!